Congress kaa haath aam aadmi ke saath? Madam ka haath apne Governors ke saath! Manmohan ka haath - what haath guys? Do I have hands! Aur Buta ko akele pad rahi hai logon ki laat. Aur Rahul baba. Unhein to hum bhool gaye! Rahul Gandhi would like to believe India is ready for him. Or has he would like the electorate to believe that he was misquoted by the press that he is willing to take over greater political responsibility if the 'High Command' directs him. Rahul has been in the parliament for over three years now. He has certainly not demonstrated to India that he is ready for bigger things. He has rarely spoken in the Parliament. In his own constituency, he is known to be someone who keeps a low profile. In Uttar Pradesh, the state that sends the most MPs to Delhi, the Gandhi surname doesn't mean much except in ancestral bases like Rae Bareilly and Amethi. In a state where caste equations vary from village to village, the Congress (I) has not been able to crack the code to the mysteries of caste politics. Unfortunately for Mr. Gandhi, caste matters more than charisma in the Hindi heartland. What I fail to understand is the media who covers every word Rahul utters, doesn't question whether this young leader has a vision? If not a vision, then at least a plan, Sir! Secondly does he have a political base? Regrettable Mr. Gandhi lacks both. Let me refresh his party's short memory by reminding them what Rahul baba said. 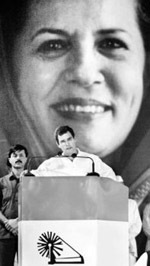 "I think we are not successful in these areas because we have stopped working for the people, [we] could not match their aspirations," he said speaking about the fast eroding Congress support in Northern India, at the last AICC plenary at Hyderabad. He further added, "move away from the corridors of power and listen to people and understand because leadership is created by listening and understanding rather than through posts." Let me take a wild guess, he is practicing what he preaches - by standing away from the political mess that his party is in right now and listening! I don't recollect Rahul making a statement on Natwar Singh and the Volcker report. I don't know whether Rahul has an opinion on the proposed reservation hike, because I haven't heard what he thinks. Or on any issue of national importance. Does this 35 year-old, whom the Congress is so keen on thrusting into our faces as the next Leader of the Nation, have any views at all? Does he have any opinions on foreign policy? Or economic growth of the country? Or the uniform civil code? What is his stand on corruption? Or anything! Well listen to this Mr. Gandhi. What India needs is a party which can face the electorate in the first place. The BJP has its Mody and Advani; Congress its Natwar and Buta, CPI its bunch of Yechuri and Inc., RJD its Laloo and so on... Why do these people and more of their ilk exist in national politics today? If they are as vile and corrupt as everyone claims they are, why are they still enjoying political patronage? Why are honest people never given tickets to elections? And those who do make it to the power corridors, why are they made to bow to political remote controls? Why real issues are never discussed in Parliament? Why does the Indian voter never get value for its ballot? The media is as responsible as the politicians for the state that the nation is in today. For selling their copies daily, the newspapers and the television channels as the first one to report on Scandals and Personalities but never Issues. Politics has been reduced by this family as a profession of convenience. Have time, will serve is the motto. It is rather disappointing that the media who should be acting as a watchdog of democracy has been reduced to a tabloid who is busy reporting who partied where and with whom. The media who should be asking questions on our behalf is too busy serving the communication and promotion needs of its political patrons. Maybe we as Indian citizens shouldn't expect answers to these questions because those in power know that we have short memory spans and we will forget all these by the next general elections! Or maybe not... Remember 'Leaders' such as Rahul Gandhi & Co. cannot be thrust upon people and nor can they be created by the surname, the party, the mother or the media! Leaders have to prove themselves worthy to be followed. The first way to do so is to Speak Out! Alas if charisma and charm was all it took, the country would be at the mercy of Mallika Sherawat and Priyanka Chopra and the likes. Ahem Mr. Gandhi, it takes a lot more than dimples to be a leader.